Turmeric, a spice commonly used in Indian curry, has a long history of medicinal use in Chinese and Indian Ayurvedic medicine. In addition to eating turmeric in cooked dishes, you can mix the powder or extract into water and drink it as a tonic. This pungent herb contains curcumin, which may boost your body's natural healing powers. 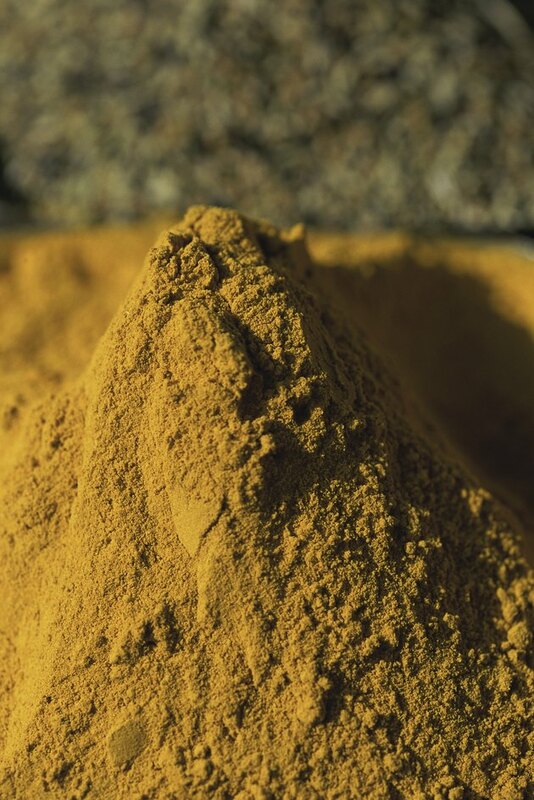 Curcumin, a component of turmeric, is a powerful antioxidant. Antioxidants are substances that help protect your body from unstable molecules that can damage cells. An abstract in "Anticancer Research" in January 2003 noted that extensive research over the last 50 years suggest that curcumin has enormous potential in the prevention and treatment of cancer. Its powerful effect stems from its ability to inhibit the spread of a variety of tumor cells. Turmeric is linked to lower cholesterol levels and the prevention of atherosclerosis, which is plaque buildup in arteries that can lead to stroke or heart attack. Turmeric may also help protect against blood clots developing on artery walls. An abstract published in "Acta Medica Indonesiana" in October 2008 noted that a study done to evaluate the effect of curcumin on total cholesterol, LDL cholesterol, HDL cholesterol and triglycerides in acute coronary patients revealed a low dose of curcumin reduced total cholesterol and LDL, known as bad cholesterol, in patients. Turmeric's ability to reduce inflammation may help relieve joint pain in conditions such as osteoarthritis. An abstract published in "The Journal of Alternative and Complementary Medicine: Research on Paradigm, Practice and Policy" in February 2003 noted that a review of literature on the anti-inflammatory activity of curcumin showed curcumin's safety. The review also indicated curcumin's effectiveness as an anti-inflammatory agent because of its ability to block different substances that play a role in causing inflammation. Although turmeric is considered safe when taken in the recommended doses, some people may experience side effects, including nausea, dizziness, diarrhea or stomach upset. According to MedlinePlus, a division of the National Institutes of Health, pregnant women should avoid taking turmeric orally because it might stimulate the uterus or encourage a menstrual period, creating an at-risk pregnancy. In addition, turmeric can cause stomach problems in people with gastroesophageal reflux disease, or GERD. If you have any concerns, talk to your medical adviser before taking turmeric.